From Rebecca MacKinnon's New Media Workshop at Hong Kong University: "The District Council Elections, to be held on November 18th, are the subject of our class reporting project." 1. The District Council election fits with our class schedule and the Legco by-election does not. 2. The Legco by-election will be a total media circus, making it impossible for students to get interviews with the candidates and difficult to do truly original on-the-ground reporting. 3. Because the district councils are Hong Kong’s most basic level of government, the candidates and issues will be much more accessible to students who want to cover the election with original sound and pictures from the scene as well as text. 4. The DC election is likely to be very under-covered by the local media, making it possible for all of you to make a unique and valuable contribution to public knowledge and understanding about Hong Kong’s local politics. I should add that the District Council election can be very interesting because one can bring in demographic data, history, personalities and local party politics. The following are translations from the blog of a former political insider. Here is an analysis that will intrigue political junkies, because we don't usually get to this level of detail. While there may be a Chief Executive 'election' going on, we have to remember that all 'true' elections are ultimately local in nature. This particular election is about as local as it can be: the by-election for the district council representative in the Kam Ying Constituency of the Sha Tin District Council. Can you even find the place on a map? How boring can this get, you say? Thanks to the blogger Derek Greyhound, you will get a micro-analysis of this election contest which will preview the tactics that will no doubt be employed in the full district council elections in November this year (before then, there will be by-elections in May and August as well). The following is summarized from Derek Greyhound's preview of the by-election (that is, these words were posted before the election results became known). Why was there a by-election in this one district? The former district councilor Wong Kwok-hung (of the Frontier party) had been charged with bribery, was found guilty at trial and then lost his appeal. The legal process took almost one year to complete and this by-election is for a new council member to serve out the remainder of the term (that is, until November 2007). What is the demographic composition of the Kam Ying district? There are the ten buildings of the Kam Ying Estates, four buildings of the Ya King Terrace and eight buildings of the private New City complex. This is a mix of middle- and lower-class housing estates so that candidates need to be very careful about choosing their issues. The specific issues would be: transportation for all residents; maintenance and administration at the public housing estates; environmental and health problems with the restaurants across New City; nighttime safety at Kam Ying; the construction of the seafront walkway; insufficient and inadequate leisure and recreational facilities. It is estimated that there are 18,426 residents in Kam Ying, of which 60% live in Kam Ying, 15% in Ya King Terrace and 25% in New City. In 2003, there were 9,209 registered voters with 382 more added last year. - Wong Huk Kam (Frontier) is a lawyer who seems to be an election ronin. Four years ago, he lost in the Wong Tai Sin election; last year, he lost in the Hong Kong south district. This time, he parachutes into Kam Ying with the support of Frontier members and the Kam Ying Stages 1 and 2 resident associations. Wong will be burdened by the fact that the previous Frontier councilor had gone to jail for corruption. The blogger predicts that Frontier may lose one-half to one-third of its former voters as a result of the scandal. - Wong Shun Loy (Liberal Party) is an accountant without any outstanding packaging, accomplishments or electioneering. His support lies with the Ya King Terrace residents plus some loose votes in New City. He is picked as the fourth and last finisher. 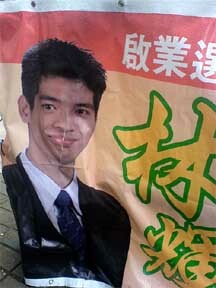 - Chen Ming Hung (Democratic Party) has youth and education plus some Taiwan-style election tactics. He is still green in district service. His forte is policy analysis, which is the wrong focus for a pre-dominantly lower-class constituency. His promotional material emphasized his experience in Tai Po and the northern district, and this gives the impression of an opportunist without local commitments. - Tong Po Chun (no party affiliation) is an educational professional with some prior experience as district councilor elsewhere. Her support comes from various school principals and professionals inside and outside the district. Unfortunately, her tactics are stuck in the 1990s (with a long list of endorsements most of whom 75% of the ordinary citizens would not recognize). Then on Saturday, the pro-Beijing Wen Wei Po published an article in support of Tong Po Chun, so this may be the hidden pro-Beijing candidate who would be revealed at the last minute. The election process was actually quite exciting. During the week before the election, anonymous letters containing smears and personal attacks were circulated in the district. On election day, the pro-Beijing election workers from other districts showed up to canvass for voters. Pro-democracy bigwigs such as Emily Lau, Raymond Wong and Leung Kwok-hung were also out there. Commentators at the blog pointed out that the pro-Beijing elements have apparently adopted a strategy -- in middle-class districts (such as Kam Ying), they will run professionals or local powerhouses as candidates without any apparent political affiliation (only to be revealed after winning the election); in their traditional strongholds, they will obviously raise their banners high. Tong Po Chun may be the first test case of a "submerged professional." Have we reached an age in which party affiliation is a political liability? I'm sorry, but unless you are a true political junkie like I am, you would have no idea where Kai Yip is or that there was an election on Sunday. In truth, I am a political junkie but I had to completely rely on the blogger Derek Greyhound here because he has local knowledge through personal experience in local Hong Kong politics. His blog post has been regarded with wonder as in: "Oh my! It is possible to analyze a district election to this depth?" This is a by-election in the Kai Yip district of the Kwun Tong area of Hong Kong. The previous district councilor had passed away during her term, and a by-election was held for an interim replacement until the next district council election. There are only two candidates. For the pan-democrat camp, there is Lam Fai, who was an aide for the late and immensely popular four-term district councilor. For the pro-Beijing side, there is Sze Lun-hung of the DAB party. This particular by-election was considered to be a bellwether for the Hong Kong SAR-wide district elections later this year. Would the recent remarks DAB party chairman Ma Lik about June 4th have any bearing on the outcome? Here are the blogger Derek Greyhound's predictions (and I am doing a huge disservice here because a great many details (such as the demographic analysis of the electorate) are omitted): Voter turnout is predicted to be between 35% to 40% (but may be reduced to 30% to 35% on account of the heavy rains) and Lam Fei should get at most 40% of the vote. According to the official results (Electoral Affairs Commission): The voter turnout was a very high 47% (3,392 out of 7,221 registered voters). Lam Fai received 1,352 votes (or 40%). So the blogger Derek Greyhound was wrong on the voter turnout but uncannily correct on the share of votes. How did it turn out this way? According to the blogger Derek Greyhound's analysis, district council elections have nothing to do with macroscopic issues (such as the vindication of the June 4th incident). It is more about maintenance/cleaning at public housing estates, bus routes, street lamps, police patrols, pedestrian overpasses, and other local issues. It is also about local organizations. In the case of Lam Fai, his background was unusual in that he has no connections to the traditional political machine in the pan-democratic camp. His two assets were that (1) he was the aide to the late and immensely popular District Councilor; and (2) he was tagged as a member of the "new left" involved in issues such as the Star Ferry, Queens Pier and similar issues. Thus, Lam Fai might as well as be an independent. His opponent comes from the DAB which has a strong labor union/grassroots network. On this day, it would seem that both sides got all the votes out that they could. But the DAB happened to have more votes. Elections can be interesting. But how can one get interested without being sufficiently informed? The analysis by the blogger Derek Greyhound was what created the interest for me. Why can't every election be covered like that? Of course, I should point out that the blogger Derek Greyhound does not have to be completely correct. But he has shown that he put in the time and effort to do the basic research and made a prediction based upon his work experience. Anyone else can do the same (more research even if one does not have the relevant work experience in local politics). What can you look up by research? For example, you can look up Lam Fai's blog. On April 23, he wrote: "My banners are out in the street. In less than 24 hours, two of them have been slashed while the banners of my opponent right next to mine were untouched. Same people, different fates. Local citizens said: 'It is your fault to be a democrat.' That is right, you get the supporters that you deserve. When I saw that my opponent's banners were unscathed, I was proud on behalf of my supporters." Where in the world is Hong Lok Yuen? Unless you are a true political junkie, you would not know about the June 10th by-election in Hong Lok Yuen, much less its implications for the Hong Kong Civic Party. Hong Lok Yuen is a district council election seat in the Taipo district of New Territories in the Hong Kong SAR. The previously elected district councilor Man Chun-fai has decided to take on a more senior position and therefore his seat is up for re-election now. There will be another district council election for all of Hong Kong SAR later this year and this seat will be up for re-election again. But the result of this by-election will probably be indicative of what will happen in the upcoming election. That is to say, the winner of this election will likely win again in November. The Candidates: There were only two candidates: Tang Yau-fat who used to work for the former district councilor Man Chun-fai, and Ho Kwok-keung, who is a professional engineer. Neither candidate listed political party affiliation. However, Tang Yau-fat is with the rural sector that is supported by the pro-Beijing DAB while Ho Kwok-keung is supported by the pro-democracy Civic Party. Demographics: The estimated population in 2007 is 14,856 persons, of which about 4,629 are registered voters. There are four distinct sectors in the district: (1) the upscale Hong Lok Yuen housing area; (2) the villages near the Fanling district; (3) the private homes near Hong Kong Yuen and the old Taipo market; (4) the villages and private homes near the Taipo Industrial Estate. This setup reflects an M-shaped community -- there are some rich people and many poor people. In terms of personal income, 15% make more than HK$40,000 per month and more than 30% make less than HK$8,000 per month. Both are higher than the population percentages. In terms of education, more than 25% have university education and 20% have only elementary education. In terms of occupation, 25% are managers, administrators and professionals and 25% are in fishery and agriculture. Both education and occupation exhibit the M-shaped features. In terms of population size, the Hong Lok Yuen housing area has about 1,200 voters (or 25%). By comparison, the villages have about 3,000 voters (or 65%). Anyone who wins the villages (in an overwhelming manner) will win this election. In terms of social issues, the Hong Lok Yuen residents have their own upscale homes which should not have any issues with management and security; they drive their own cars and they will therefore not be concerned with public transportation issues; they are therefore more concerned about the images and positions of the candidates. By contrast the village residents will be concerned about basic infrastructure, recreational areas, drainage, street lamps, road repair/maintenance or even public benches to sit on. Traditionally, these problems are solved through the village network ties. Prior Electoral Results: In 1999, the previous district councilor Man Chun-fai won by 786 to 431 votes over a Liberal Party candidate. In 2003, the same person won by 1,171 versus 495 over another candidate with the same rural village background. Analysis of Outcomes: This is a lopsided contest, since Tang Yau-fat has the support of the local establishment, and he has a local field organization as well as the political accomplishments. Ho Kwok-keung has no local record or organization and his sole appeal is professionalism as an engineer. Ho might be good enough for the Hong Lok Yuen residents but he has no appeal to the village residents. "I am an independent candidate with no party affiliation. I was born here and I grew up here alongside Taipo. I have been involved in community service for more than twenty years. I am practical and pragmatic in serving the community: I want to act as the bridge between the government and the people, to obtain the rightful interests and benefits for the people, to improve the environment, public health, transportation and other matters ... if I am elected, I pledge to complete the unfinished work of the previous councilor Man Chun-fai ..."
Predictions: Assuming a turnout of 45%, there should be 2,000 votes of which Tang Yau-fat will get 1,400-1,500 (or 70%-75%) while Hon Kwok-leung will get 500-600 (or 25%-30%). Actual Results: First of all, the weather was atrocious as there were red/yellow rain warnings for six hours in the early morning. Out of 4,625 registered voters, 1,424 cast votes (at 30.78%) (see Election Affairs Commission). So the Derek Greyhound blogger was too optimistic because he was basing it upon the voter turnout in the 2004 Legislative Council election under normal weather conditions. Finally, out of the valid votes, 374 went to Ho Kwok-keung and 1,046 went to Tang Yau-fat. Thus, Tang Yau-fat got 73% of the votes (see Election Affairs Commission). So the Derek Greyhound blogger was right on. Post-mortem analysis: If the pre-election analysis was dismal, the results confirmed the predictions. The question is whether the Civic Party and the pan-democrat camp will understand that they cannot compete on this basis (namely, parachuting an outsider into a community and expect to win on the basis of the brand name (plus handing out some flyers in the street and holding a few press conferences that nobody attends)). (Derek Greyhound) With respect to the by-elections in the Hong Kong District Council, the pan-democratic camp has lost 8 of 9 by-elections. What is the excuse? Government-business collusion? Chinese Communist suppression? If these reasons actually work, then it is time to give up altogether because the other side is infinitely more resourceful! ... Getting back to Kong Lok Yuen, I saw that our opposition had all their people out. Their manpower and resources were several times that of ours. Their candidate was a member of the rural constituency and he had the full support of the DAB party ... on election day, the opposition was out there walking the streets, propagandizing and lobbying for votes. They did so much more than the democrats were willing and able to do. The low turnout also showed that the voters were not committed. I stood there from 3pm to 10pm. My back and legs hurt, but what hurts more was that the candidate supported by the democrats lost by a big margin. The implications on this day are huge. We have the desire to fight for democracy, but we still have to wait before people actually put out the effort. We try to gain the support of the people by trying to reform the system, but the conservatives look towards getting results instead. They are good at organizing, especially with respect to organizing for elections. Even if we have democracy today, the democrats cannot win. More importantly, the pursuit for democracy is spontaneous and requires commitment; if you want democracy but refuse to commit any effort, then it is futile. Who is this person saying these discouraging words? Is he a sell-out? Is he an apologist? The speaker is Ronny Tong of the Hong Kong Civic Party and those words were published in an opinion column in Ming Pao. The comments at the Derek Greyhound blog are that these ideas are true, but they are insubstantive and non-actionable given that the full round of District Council elections will take place in November 2007. The pan-democratic camp cannot suddenly discover the importance of local work five months before the elections! And it is not about realizing the importance of something or the other -- it is about what (if anything) can be done about it! (Derek Greyhound) After the its huge loss in the 2003 District Council elections, the DAB began to rebuild in 2004. They basically followed a plan which delivered effective results. In the ten by-elections since 2004, DAB has basically won every District Council by-election (with the sole exception of Tsui Wan in eastern Hong Kong Island). Furthermore, they got very good totals to the point where their opponents had to consider whether to challenge again or switch to some other district to avoid a re-match. By comparison, the pan-democrats were imposing in 2003. But victory got to their heads. They failed to capitalize on their advantages in the individual district and spent too much time and resources on the issue of political reform while ignoring local district work. This gave some breathing room to the DAB to re-organize. 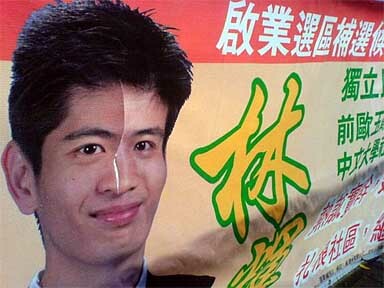 In 2005, the pan-democrats acted against the will of the public with respect to the political reform package and caused their support level to drop. As a result, the DAB nibbled at many pan-democratic strongholds. Many of the pan-democrats had been elected due to the 2003 July 1st effect, and their quality left a lot of desire. By 2006, some of them have run of energy as their local district work is undistinguished and they cannot even maintain normal office operations. The discontent of the voters will be reflected in the 2007 vote, to the advantage of the DAB. Unless the Hong Kong Island Legislative Council election is raised to the level of an epic battle and thus cause the District Council elections to become a public referendum on universal suffrage, the DAB is likely to be the biggest winners. They are fielding 200 candidates and it would not be surprising to see more than half of them get elected this time. In eastern Hong Kong island, the pan-democrats do not have a single seat on both sides of the tram line except for the middle-class area of Taikoo Shing. It is a liberated zone all the way from North Point to Tin Hau. On eastern Hong Kong Island, apart from the far eastern end, the pan-democrats have weak accomplishments as well as various personnel problems that caused disunity. But the population characteristics and geographic environment are also decisive factors. Along the tram line from Tin Hau to Shau Kei Wan, most of the buildings apart from Taikoo Shing are standalone apartments, small private apartment clusters or even old buildings with many pro-Beijing and lefts social networks, such as the resident associations. It is hard for the pan-democrats to do local district work, or publicize inside the private estates. So how can the pan-democrats send anyone into these districts? Presently, only the Democratic Party is providing limited local district service between Tin Hau and North Point. As for the pan-democratic turf in eastern Hong Kong island, these are relatively new districts, large private apartment estates or newly constructed public housing estates (such as Siu Sai Wan and eastern Taikoo Shing). It is easier to conduct local district work at the public housing estates, with the best example being Aldrich Garden. But there are not too many public housing estates in eastern Hong Kong Island, with most of them being in Shau Kei Wan and Chai Wan. This explains why the pan-democratic strengths lie in the eastern end of Hong Kong island. Speaking of Aldrich Garden, the population are mainly from the public housing estates of Oi Tung Estate, the private housing estates of Tung Yuk Court and Aldrich Garden. This is a relatively new district, with quite a large number of the people being relocated from the now demolished North Point Estates. The Democratic Party Legco members had located their offices in North Point Estates, but the district council seat had always been held by the DAB. But when the entire estate was re-located, the social network was disrupted. With the July 1st effect in 2003, the DAB candidate lost to the Democratic Party by 2,200 to 2,500 in Aldrich Garden. The DP candidate also did well to assist the public housing estate residents to re-locate and therefore won over many former DAB voters. So this is an additional factor over and above the structural change in the population.